Many audio enthusiasts like audio tag editing as this enables them to get the right information in an organized way during playback or folder browsing. mp3DirectCut  that I reviewed recently does this job fairly well; but if you are looking for something that can do advanced jobs, you cannot go wrong with a multi-OS tiny portable freeware like Mp3tag  that offers myriads of features and functions that you may wish you could know long time ago. 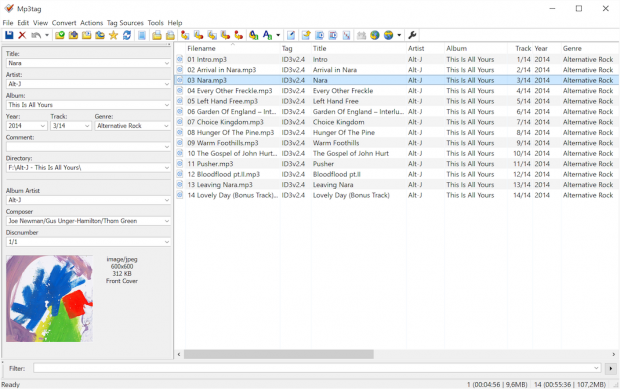 Mp3tag is a powerful and easy-to-use tool to view, edit and filter metadata of common (and some scarce) audio files automatically as well as manually. Mp3tag supports batch tag-editing of ID3v1, ID3v1.1, ID3v2.3, ID3v2.4, MP4, iTunes MP4, WMA, APEv2 tags and Vorbis comments for multiple files at once covering a variety of audio formats. You can save typing, and lookup to import tags from online databases like Discogs, freedb, MusicBrainz, and more that allows you to automatically gather proper tag info, download cover art, and add album cover to your selected file in your music library to make it even shinier. You can replace strings (characters or words) in tags and filenames (with support for Regular Expressions). Mp3tag helps create and manage playlists automatically while editing. You can rename files based on the tag information, and import tags from filenames. This utility lets you to generate nice reports and lists of your collection based on user-defined templates by exporting them to HTML, RTF, or CSV. User-interface and tagging are fully Unicode compliant. Besides these key highlights Mp3tag offers a variety of other functions and features ranging from batch export of embedded album covers, over support for iTunes-specific tags like media type or TV Show settings, to combining multiple actions into groups that can be applied with a single mouse click. If you just go through the screenshots  given in the developer’s website, you will know how effortless it is to use Mp3tag! If you would like to run Mp3tag from a removable USB device without installation (portable; stealth is yes), download the installer and launch. When prompted, select ‘Portable Installation’, and ‘install’ to a folder of your choice. Delete Mp3tagSetup.ini, unnecessary language files and flag icons. Launch Mp3tag.exe. I have tested Mp3tag in Windows 7 Professional (and Home Premium) 64-bit. Advanced audio coding (AAC), Apple lossless audio codec (ALAC), audio interchange file format (AIF/AIFC/AIFF), direct stream digital stream file (DSF), free lossless audio codec (FLAC), matroska (MKA/MKV), monkey’s audio (APE), mpeg layer 3 (MP3), mpeg-4 (MP4/M4A/M4B/M4V/iTunes MP4), musepack (MPC), ogg vorbis (OGG), internet engineering task force (IETF) opus (OPUS), optimFROG (OFR/OFS), speex (SPX), Tom’s audio kompressor (TAK), true audio (TTA), Windows media audio (WMA), wavpack (WV), wav (WAV). If you are an acoustic connoisseur, you must confess that you crave for a power audio tag editor. And, here is a really mighty one for you to play around with. I agree to the developer when the guy claims Mp3tag as the universal tag editor and more. Would you give this little gem a +1? Or, you prefer using another tool? My curiosity knows no bounds; let dotTechies know in the comments section below!